St. Alphege was born about 954. Young Alphege began his religious life as a monk in the monastery at Deerhurst. After years of living in solitude, he was appointed Abbot of Bath. So remarkable was his personal austerity and strictness of rule, that St. Dunstan – Archbishop of Canterbury at that time – took notice of Alphege and in 984 elevated him to the bishopric of Winchester. 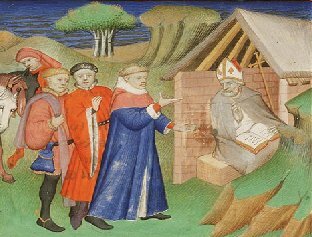 St. Alphege was a humble man who did not seek a high position; nor did he want to leave the monastery. But he obeyed the will of God and, at the age of 30, started serving at Winchester. As bishop, Alphege continued to lead a life of severe self-deprivation. Constant fasting made the bishop so thin that, as his parishioners noted, one could see through his hands when he raised them to heaven during the Liturgy. But the saint’s austerity did not extend to his flock. On the contrary, his generosity to the poor was exceptional. It had been recorded that, in all twenty two years of Alphege’s service, there was not a single beggar in the bishopric of Winchester. In 1006 Alphege became Archbishop of Canterbury. Times were difficult for the country, because England suffered frequent raids and invasions by the Danes. Canterbury was besieged. Throughout the siege, the residents of Canterbury implored their archbishop to flee and take refuge in a safer place, but he declined. The saint served daily Liturgy in the cathedral and encouraged the defenders. In 1011 Canterbury fell, betrayed by Edric Streona, an alderman,* who went down in history as “refuse of mankind and shame of the English.” Edric made an agreement with the Vikings and revealed to them the military secrets of the Anglo-Saxons. The barbarians broke into the city and, infuriated by the long resistance of its citizens, committed a horrific massacre. No man, woman or infant was spared. The cathedral was set on fire. In the midst of the violence, the archbishop pleaded with the enemy to stop killing the innocent. The Danes took many prisoners, St. Alphege among them. The conquerors hoped to receive a large ransom for archbishop’s life. St. Alphege, bound and beaten, was thrown into a dungeon where he spent several months. Then, a mysterious illness began to spread among the Danes. It quickly turned into an epidemic that took many lives. The barbarians decided to see if the man who served the Christian God could help them. They took the archbishop out of jail and demanded that he cure them. St. Alphege prayed for the enemy and asked God to relieve their suffering. As a result, many Danes recovered, and the illness stopped spreading. The miracle, however, did not change the Vikings. The archbishop’s life, they announced, would be spared only if the citizens of Canterbury paid 3,000 pounds in gold. The saint refused to lay such a heavy burden on the city, which had already lost everything. He was thrown back in the dungeon. The saint is said to have died near Greenwich*** during Bright Week. The monks secretly buried the archbishop in the church of St. Paul in London. King Canute, a Christian by faith and Dane by origin, had the body transferred to Canterbury Cathedral. In 1105, it was discovered that the body of St. Alphege had remained incorrupt. ** The Anglo-Saxon Chronicle, 142.